Story comprehension and vocabulary learning system that brings children's books to life on DVD. The illustrations are animated and the text highlights and animates on screen as the story is being read to the child. Throughout the story, the child is asked comprehension and vocabulary questions that they can answer using the wireless controller. 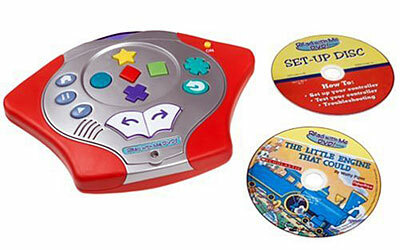 The Read With Me DVD system includes a wireless controller, a DVD featuring a classic book, and a storage case for the DVD. Play story games or answer questions and define words in interactive mode. Builds story comprehension and vocabulary skills. Sturdy console with large buttons easy for toddlers to operate. Kids hear animated story read or turn off narration and read at own pace.